The season ended just over a week ago and already the ridiculous is coming in waves. A look at Twitter (perhaps that's the problem) confirms what we already know: This summer is going to be stupid. We knew the potential for ridiculous was out there from the start. 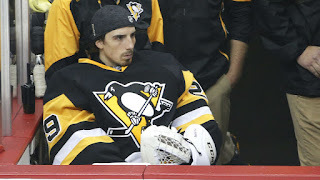 The inevitable Fleury/Murray showdown, along with the likelihood of expansion, meant Marc-Andre Fleury was a prime target for rumor-mongering and whispers in dark alleys. The season wasn't even over before somewhat reputable sources stated that Fleury's agent had requested a trade in favor of his client. If there's smoke there may be fire but this spark didn't even ignite to where this became any more than an aside in discussions. The fact remains that Marc-Andre Fleury has a Limited No Trade Clause with 12 teams he can't be traded to by his own doing. That's nearly half of the league, and the odds that Calgary is on the list seems low. While Calgary is the team that seems most in need of a goalie, there's little else of note there. They're a young team that made the playoffs two years ago, yes, and missed this year because of poor goaltending. However their recent coaching hire leaves much to be desired. The city of Calgary is an entire country away from where he's raised his child and lived for the past decade and it's just as far from his home town and his family in Quebec. That's not even to mention that, arguably, Pittsburgh's future is brighter during Fleury's prime. There's also the job stability factor. He could move to Calgary (the first and, as far as we know only, suitor for Fleury) and sit there, pad his stats just to enter the Hall of Fame later on. Two Cups, the goaltender for two Cup runs, an Olympic gold, and likely over 500 wins is a resume you're hard pressed to ignore when it comes to entrance in to the Hockey Hall of Fame. However the odds are he's not leading Calgary to any more glory. The other option is to stay here another year and rebuild your stock. Split time with Murray. The worst case scenario? Murray proves himself to be a true franchise goalie and you are riding along side, with a near 50/50 split, to another Cup run. The best case scenario? Matt Murray is the Matt Murray that we saw heavily insulated in the Eastern Conference Finals and Cup Final. While Murray made some spectacular saves when necessary, his play evened out and he was more than beatable down the stretch, allowing soft goals in quite a number of games. If that's the Matt Murray that we see in the regular season, it means more Marc-Andre. It means more time. It means it's his team again. Looking from the top Jim Rutherford holds every card. While there are other goalies available, goalies like Ben Bishop, none have a resume that can touch Marc-Andre Fleury. It's a resume that has Cups, that has large numbers, that has athleticism that you can't teach, and a goalie in his prime. It also boasts the longest tenured Pittsburgh Penguin. For their stars, and loyal soldiers, the Penguins have always been known to do things that help both parties. The Penguins won't ship Marc-Andre Fleury out for scraps. They know his worth, both in terms of what he brings on the ice (which is unique in the market) and in the emotional sentiment he packs. Jim Rutherford won't settle for less than top dollar for Marc-Andre Fleury. Nor should he. He holds every card. Most believe Fleury is gone this season. Such thinking relies on taking the first offer and settling. Management wouldn't do that to an important asset, nor would they do that to a human they hold in high regard. Expansion? That's an issue to worry about later. Fact is that expansion is next year, and next year teams other than the Las Vegas How Did They Get a Team Before Quebec's will need a goalie. As soon as your season ends, you take your excess goalie and you sell him. Until then the only way you move Fleury is if you receive the moon. This is, hopefully, the height of the Summer of Stupid with no truth to the report. It means that the Blackhawks are counting on buying low on Evgeni Malkin, who just finished a Cup run on one arm that may need surgery. Stan Bowman is seeing a dented dish washer and asking the Home Depot for a discount. Worth a try but no chance it'll work. Even if they're offering top dollar, outside of Jonathan Toews what do the Blackhawks have to realistically offer that will replace the unique approach and special talents that Evgeni Malkin brings to the ice every night? As much as he may frustrate, he's a top five player in the league. You don't replace that. You'll lose every trade you make. Why would Marc-Andre Fleury choose Calgary? Why would the Penguins willingly send him for anything less than the 6th overall pick? Why would the Penguins trade Malkin after winning the Cup? What could they realistically get that would replace the special qualities he possesses? The Summer of Stupid has just begun and we're already overwhelmed by the ridiculousness. Let's hope it doesn't get any worse.